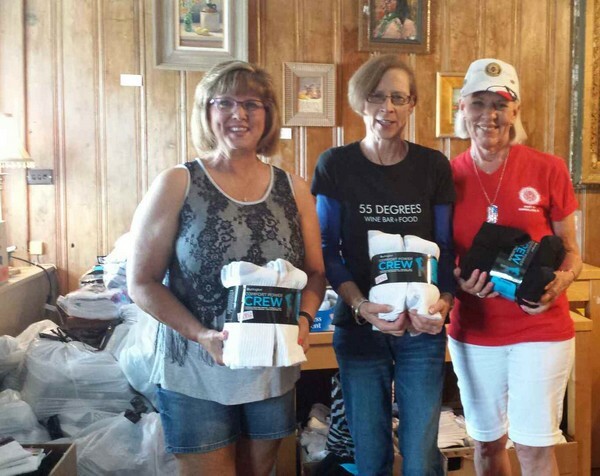 Care Packages for Soldiers: Socks for Soldiers collection in Downtown Carrollton a big success! 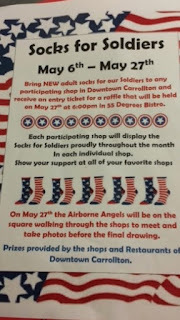 Socks for Soldiers collection in Downtown Carrollton a big success! 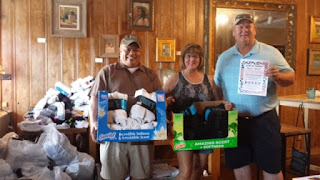 The Airborne Angel Cadets of Texas would like to send a Big Thank You to Susan Myers of Silver Star Mercantile, the City of Carrollton and it's community, and the Merchants of Carrollton's Downtown Square for their month long drive of collecting socks for the soldiers. The 'Socks for Soldiers' drive was a huge success, as they collected over 1,500 pairs of plain colored socks. Our Angel, Cindy Hicks, went to the square on Saturday May 27th and met a wonderful group of people. They welcomed her with open arms and LOVED what we do. Thank you Cindy for stepping up and attending this event. She met The Bishops from 55 Degrees, Alex from Sam Pack Ford, Andy from the Carrollton City Council and folks from The American Legion. These wonderful donations of socks will be included in our care packages being mailed to U.S. Military Troops deployed in remote locations overseas. Amazing Socks for Soldiers collection drive in Downtown Carrollton. Proud supporters of the socks for our soldiers care packages! 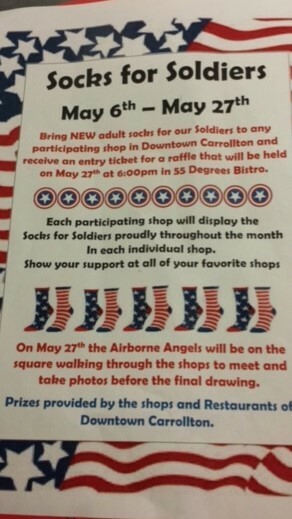 Socks for Soldiers Collection Drive in Downtown Carrollton, TX.